In 1943 the tide began to turn against Germany on the Eastern Front. Their summer offensive, Operation Citadel, was a failure and the Red Army seized the initiative, despite appallingly high losses. Waging a war of attrition, the Russians gradually pushed Germany’s Army Group South back. By October 1943 the Russians had reached the Dnepr in Ukraine, Kiev was liberated, and the scene was set for the events described in this book, written by a high-ranking General Nikolaus von Vormann, who commanded XLVII. Panzerkorps. 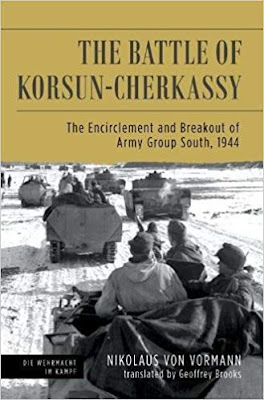 The battle of Cherkassy is also known as the Korsun Pocket, Korsun being the small town at the center of the area containing the surrounded German forces. After sudden attacks by the 1st and 2nd Ukrainian Fronts, in January 1944 the Russians achieved a major encirclement of six German divisions, a total of 60,000 soldiers. The Red Army had the numerical advantage, but two of the Panzer divisions were in good shape, and thus a dramatic battle ensued, with each side both attacking and defending. Strenuous efforts to avoid another Stalingrad were made, with the Germans led by Erich von Manstein attempting to break into the pocket. Atrocious weather plus effective resistance repulsed their attacks and by mid-February it became clear that breaking out of the pocket was the only option for the Germans. Abandoning a huge amount of equipment and the wounded, they succeeded and rejoined the surrounding panzer divisions. The Germans avoided a catastrophe but 34% of the troops did not survive. Generalleutnant von Vormann’s account starts with the retreat to the Dnepr in 1943, describes the battle of Kirowograd from 5th-17th January 1944, the encirclement, the efforts to relieve the trapped troops, the struggle of the troops within the pocket, and the breakout. His mainly factual account also contains a description of the psychological effects on the men of this most brutal and physically exhausting battle. It is one of the few primary source materials that exists and is therefore of significant historical interest.